I am a "Rocky" Junkie and Here is Why! 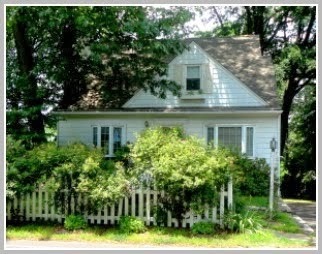 As you may or may not already know, I grew up in a little town just outside the city of Philadelphia. I was in junior high when "Rocky" was being film just about 10 or so miles from where I lived. I remember the film's release and the talk that followed about what a masterpiece the picture truly was. But at that time I was a 8th grader who had absolutely no interest whatsoever in Rocky, the sport of boxing or anything else remotely tied to the picture. It was so far removed from where I was in my life and all those things I held important as a 13 year old girl, I never ever saw the picture until...oh about about 3 years ago. It was right after Christmas and as I started taking down the tree I flipped on the TV just catching the end of some program I was interested in. So after the show ended, instead of changing the channel as I normally would do, I just let it run. All I wanted was a little background noise while taking down the decorations and returning the living room to its normal state of existence. In letting the TV run I stumbled upon something I related to so deeply that by the time it was over I was nothing less than riveted to the television screen. 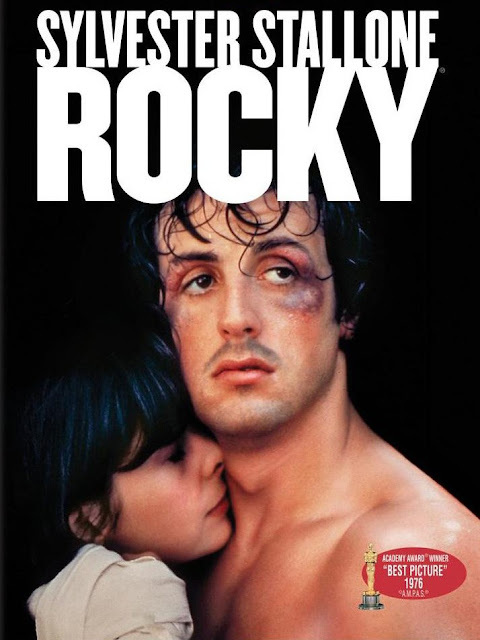 It was Rocky, the original one released all those years ago that I couldn't be bothered with. I think my connection with Rocky started when I ran my first long distance race. 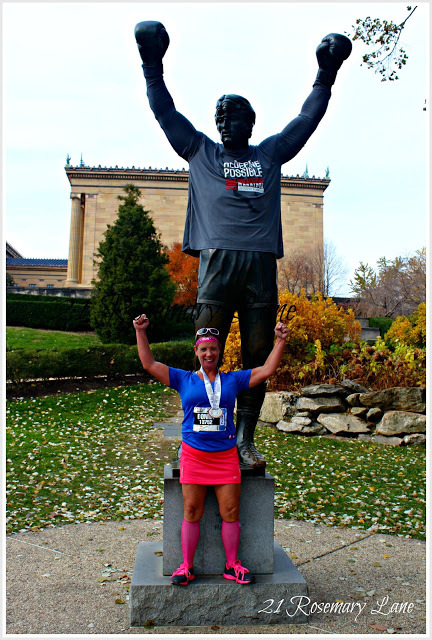 It was in May of 2008 and I ran the Philadelphia Distance run with my best friend Donna. She had talked me into running the 10 miler which is supposedly almost all downhill. So we trained individually for the race. I went in well prepared but Donna just couldn't find enough time in her busy schedule to train more than a 4 or 5 mile run. So during the race at about mile 5 Donna told me to just go on and that she will catch up with me at the finish line and I took off. At about mile 8 the speakers along the race path started blaring the theme to Rocky. I remember thinking to myself that I was just about to accomplish something I never in my wildest of dreams thought I would ever do...run 10 miles. I remember becoming extremely emotional as I listened to the lyrics of the music to point of almost tears. Three years later after Donna and I finished the New York City marathon we met up with family and friends at a little pub in Manhattan for a celebratory drink. 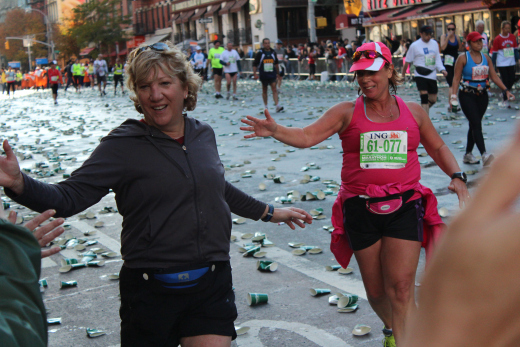 As we walked in with our Mylar ponchos over our shoulders and carrying our race bags the bar put on the song "Eye of the Tiger" in our honor and everyone in the place began to cheer for these two worn out and beat up marathoners. 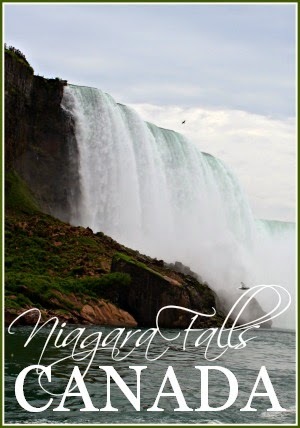 I again was almost in tears at the thought of our accomplishment. What makes the movie extraordinary is that it doesn't try to surprise us with an original plot, with twists and complications; it wants to involve us on an elemental, a sometimes savage, level. It's about heroism and realizing your potential, about taking your best shot and sticking by your girl. It sounds not only clichéd but corny -- and yet it's not, not a bit, because it really does work on those levels. It involves us emotionally, it makes us commit ourselves: We find, maybe to our surprise after remaining detached during so many movies, that this time we care. I think that is what happened with me...it made me realize my physical potential. I've heard it said that just getting to the starting line of a race is half the battle, and having done that I realized how true that sentiment really is. 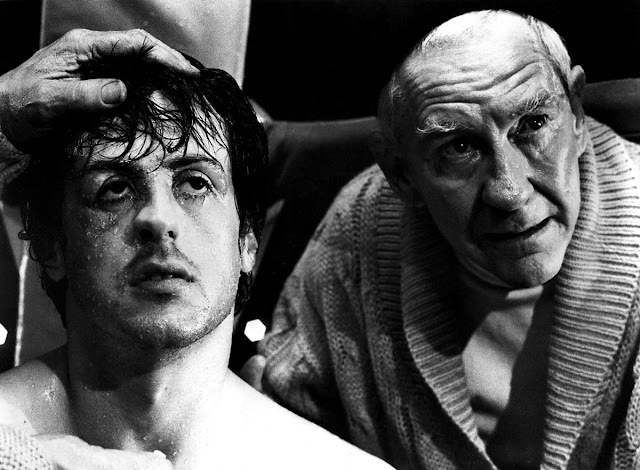 And in each Rocky story line that entire concept is reinforced for me. So now I am a total Rocky Junkie. It can be on anytime of the day or night and I just can't ever seem to bring myself to turn it off. 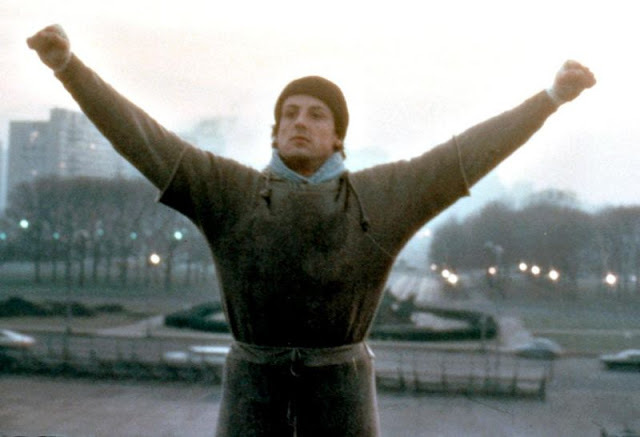 It would feel almost sacrilegious to me to not watch Rocky's journey. To date I have seen all the Rocky pictures with the exception of the latest release Creed, of witch Sylvester Stallone is up for best supporting actor. Here is Stallone's interview with Robin Roberts as he discusses how Rocky changed his life and about his part in Creed. I will be on my sofa tonight waiting to see if the academy's nomination of Creed's Sylvester Stallone for best supporting actor gets the nod and an Oscar award! I don't know if it because of the unseasonably warm weather we have been having coupled with the birds singing and my first glimpse at a robin red-breast, but I have been in Spring mode for about a week now. 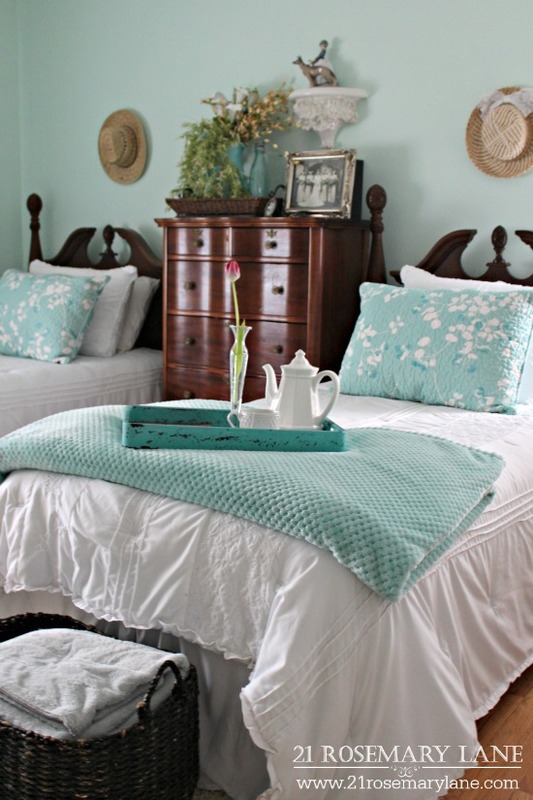 So the other day as I was cleaning the guest bedroom to get it ready for my parents stay over last weekend, I decided to give the room a little injection of spring. 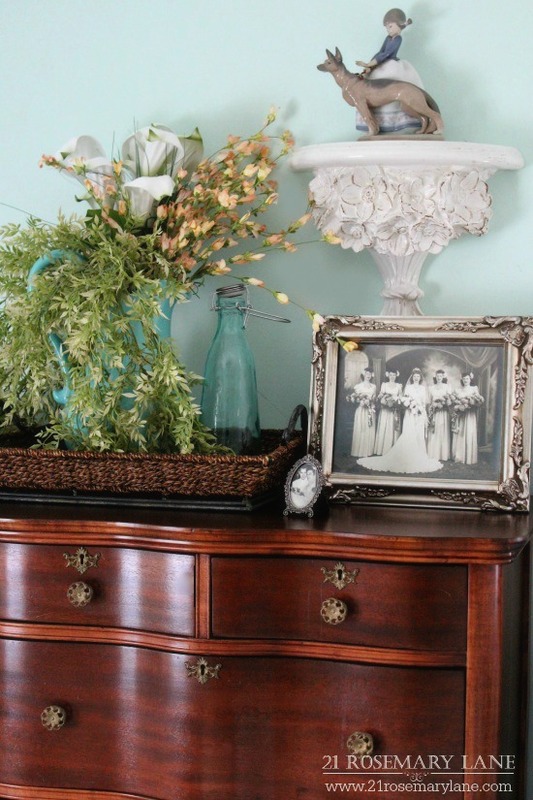 I moved around some furniture and added a few florals reminiscent of spring. 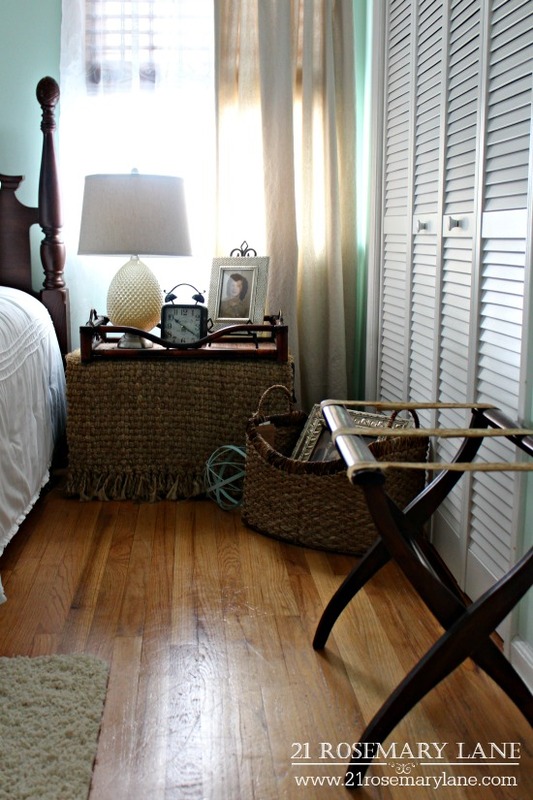 A luggage stand picked up at a yard sale comes in handy in the guest bedroom. 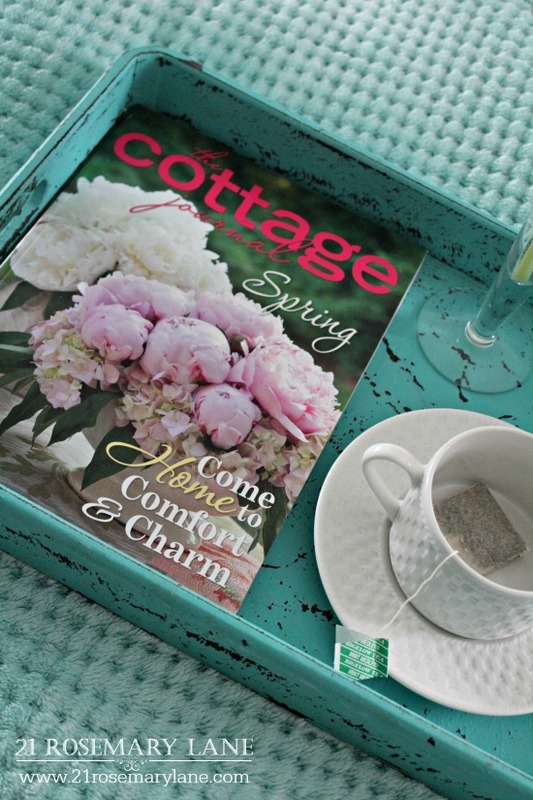 ...along with a favorite magazine. 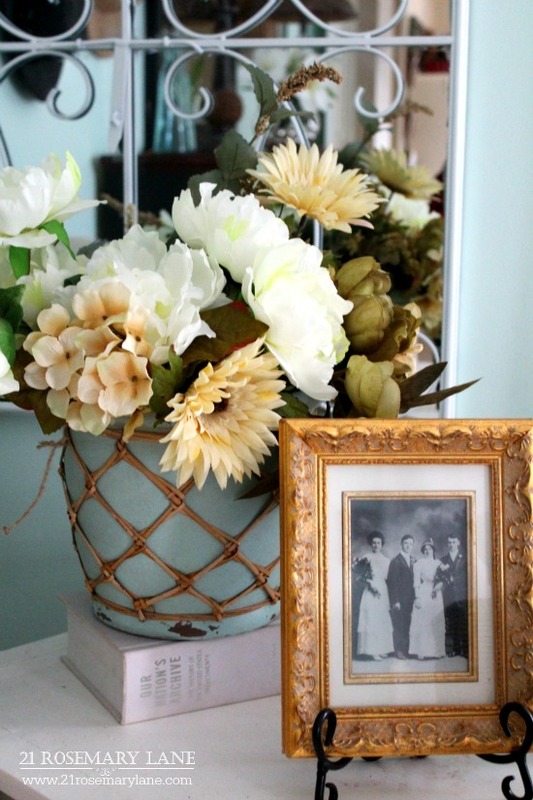 Old family wedding photos around the room work both as artwork and a reminder of the new beginnings soon to come. 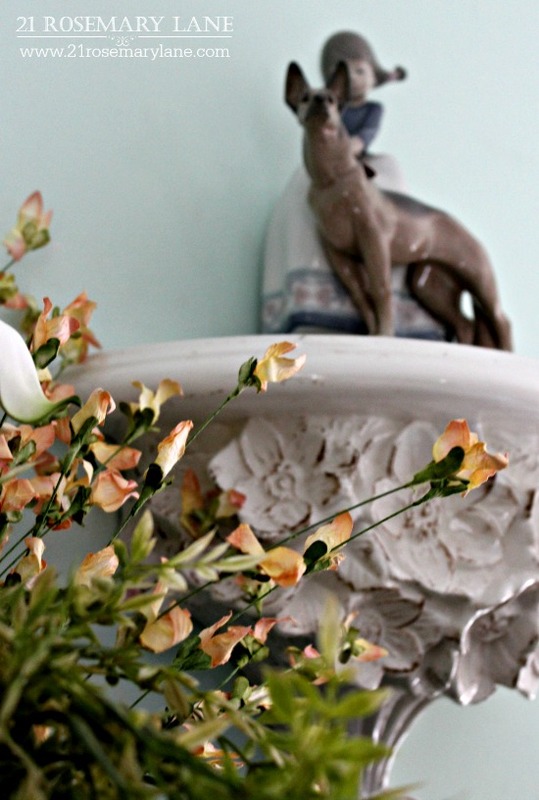 I am really getting inspired for spring's return. How about you??? 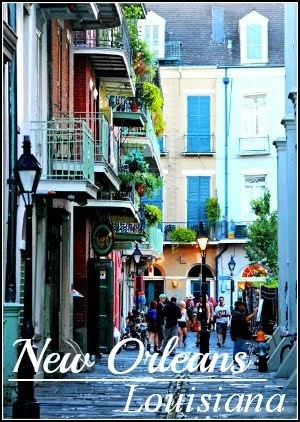 Are you thinking spring yet? 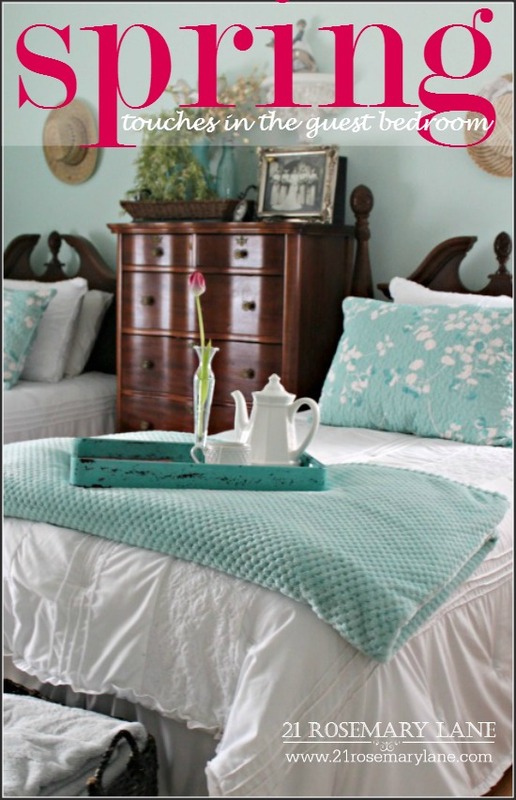 If you are looking for some more inspiration check out my Springspiration board on Pinterest by clicking here. Also make sure to mark your calendars for this March so you don't miss a minute of the Spring Home Tours put together by my sweet friend Marty of A Stroll thru Life fame. 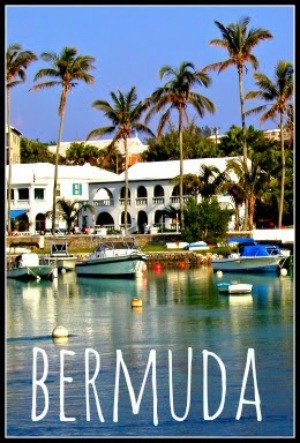 Thirty homes will be featured including yours truly!!! And please remember to have a wonderful weekend! 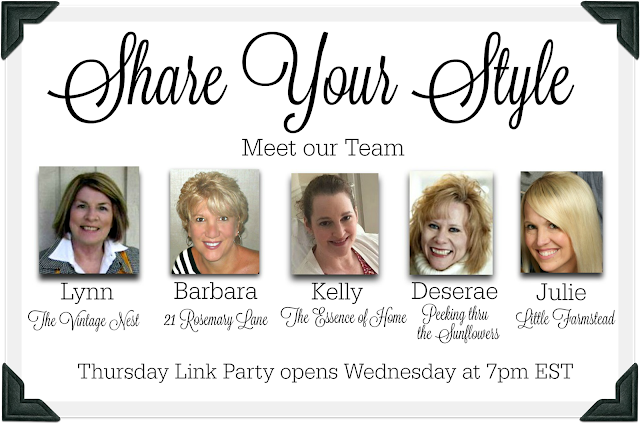 Hello and welcome back to another fabulous Share Your Style link party. 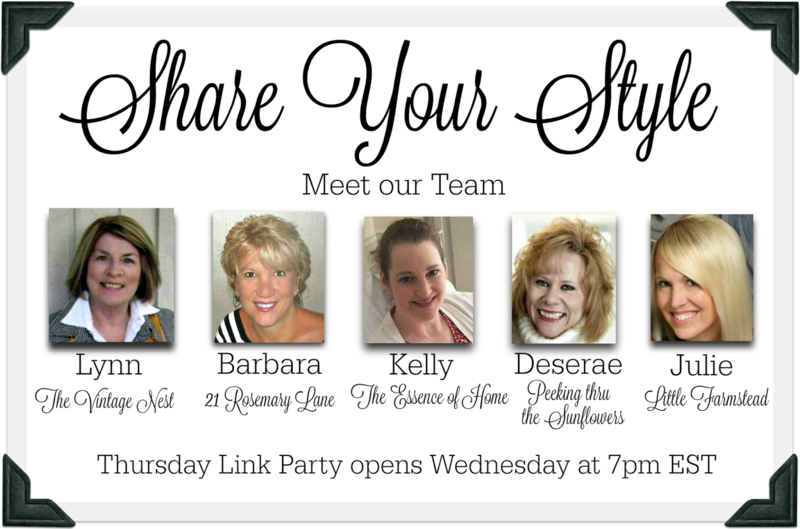 This week your hostess is moi, Barbara, from the blog 21 Rosemary Lane and I am thrilled to be here. 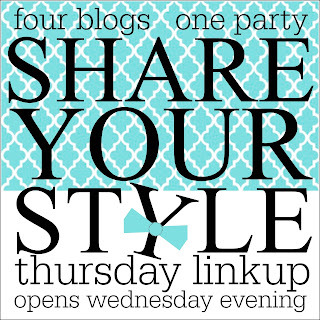 Remember, when you link up it will display on all FIVE blogs at the same time! 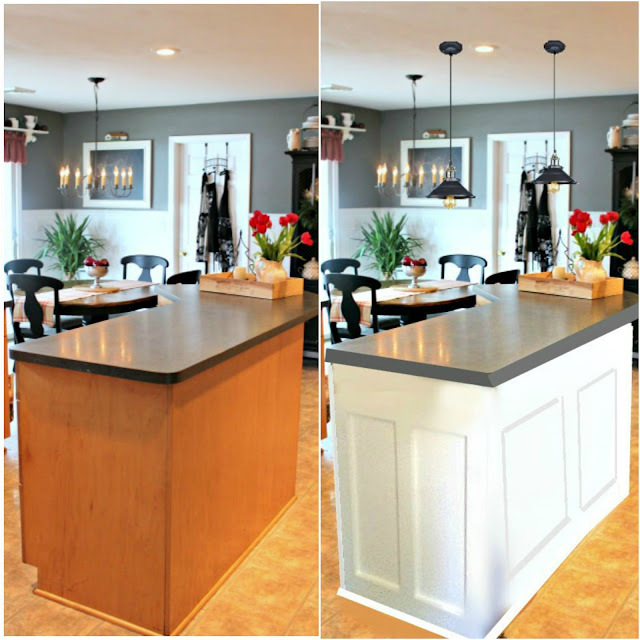 Over the past few weeks on 21 Rosemary Lane I've shared my mock up of our kitchen island with a few lighting options to choose from. 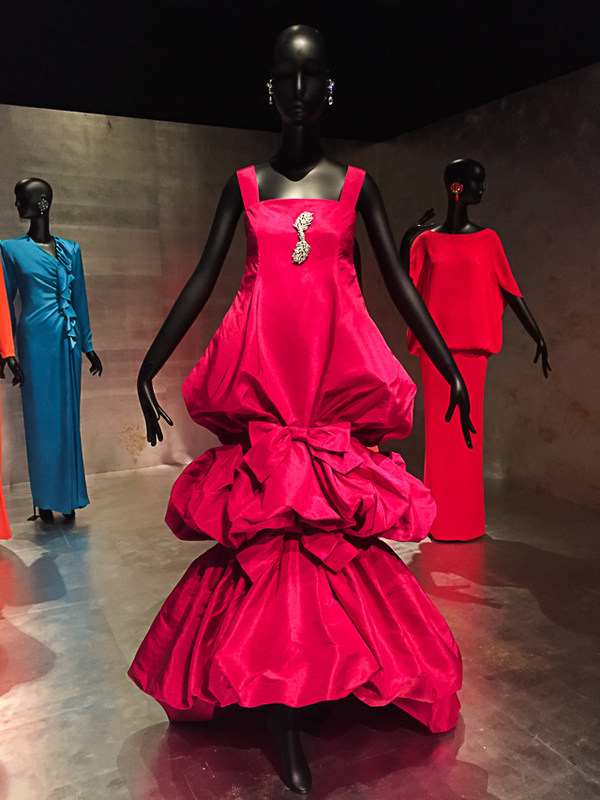 I also took you to on a tour of New York city's Metropolitan Museum of Art exhibit, The Style of Art, which features the fashion creations of French born countess, aristocrat and designer Jacqueline de Ribes. What a great way to spend a day in New York! So now it is on to this week's party features!!! 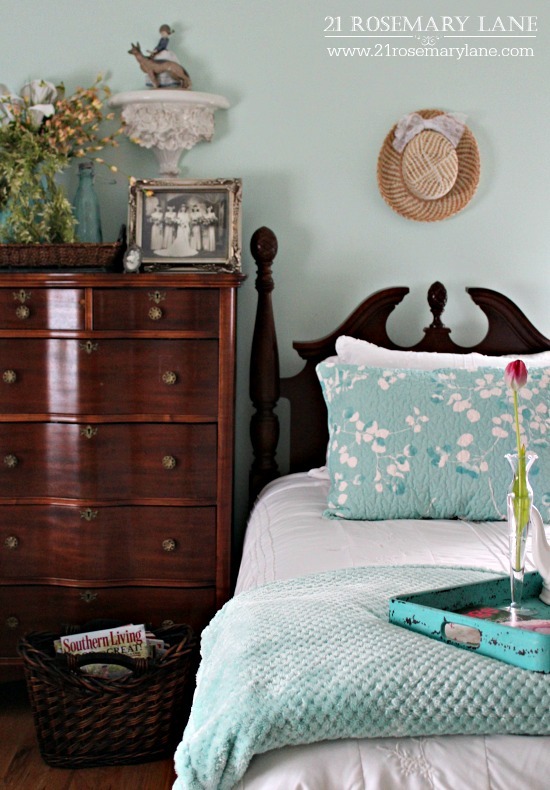 First up is a gorgeous home tour from the blog Simply Vintage by Suzan. 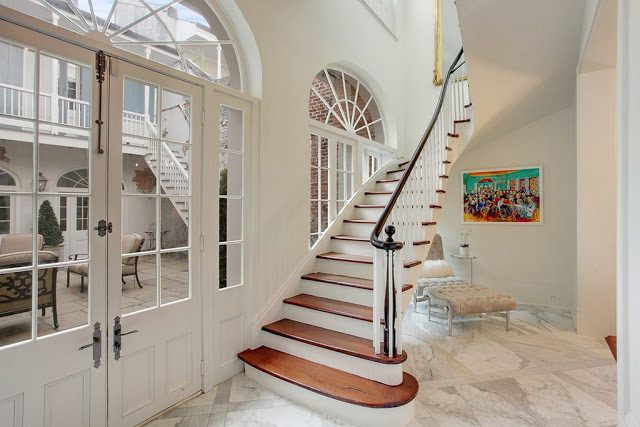 This home is in one of my favorite places, New Orleans, and it is simply stunning! 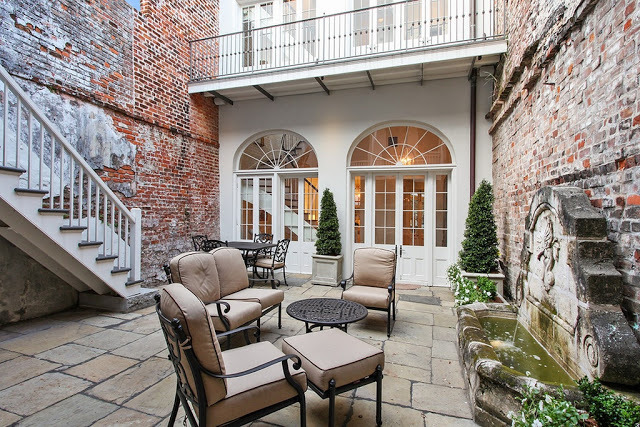 It is going for a cool $1,875,000. Whatayathink?? Any takers?? 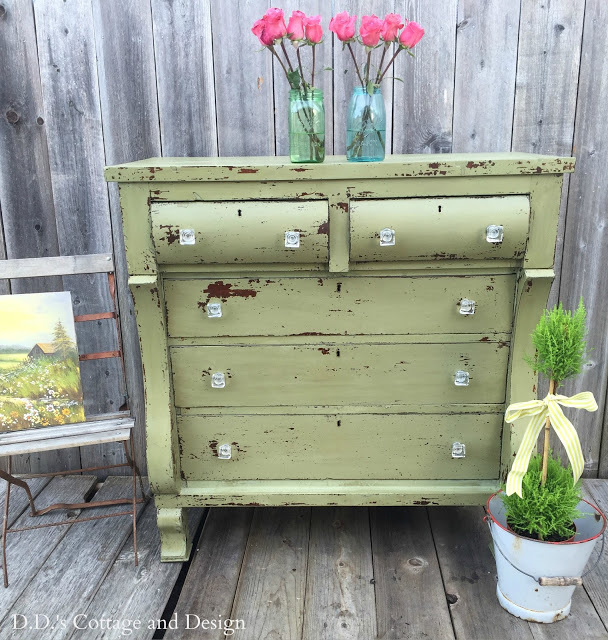 The next feature is a pretty empire dresser that D.D. 's Cottage made over with a chippy green finish. 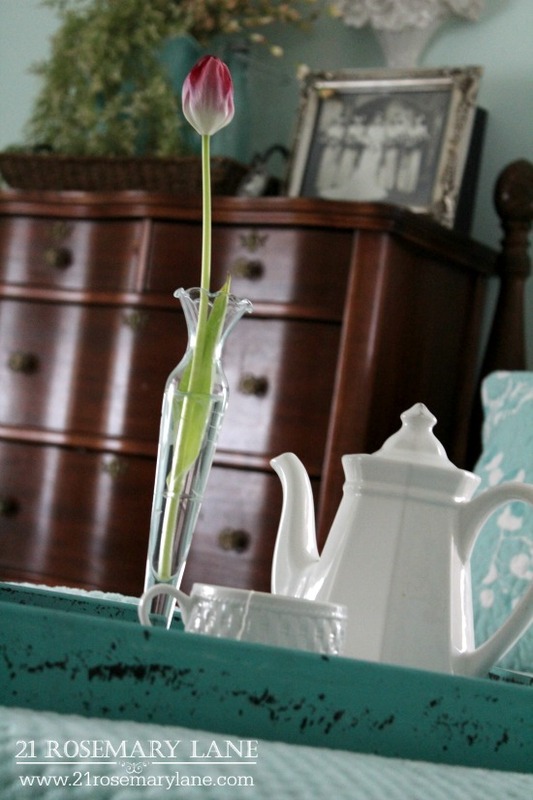 I adore those curvy lines and the green color just screams spring!!! 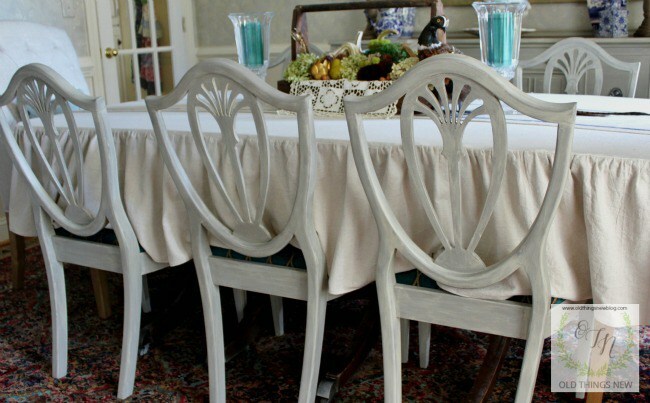 Patti from Old Things New shared not only her tale of woe involving a flat tire and AAA, but also shared a wonderful tutorial on how to make your own ruffled French country tablecloth using a painters drop cloth. 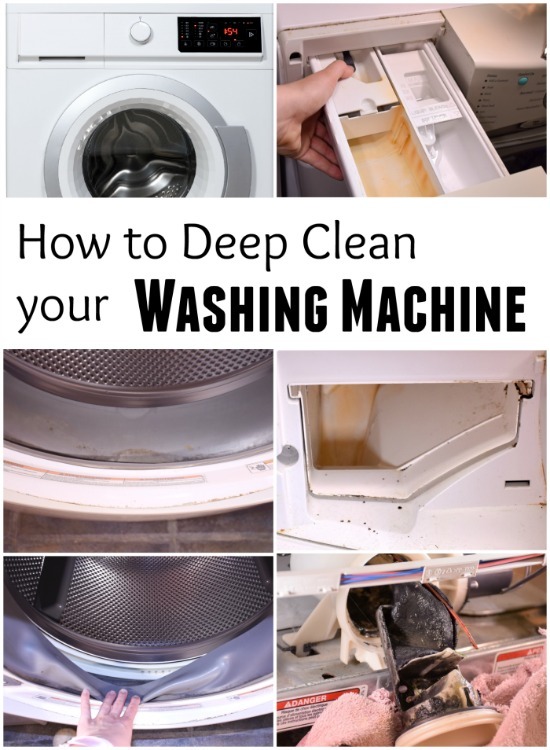 If you own a front loading washer then you are probably all too familiar with the odor that comes from a moldy build up. Kendra from A Proverbs 31 Wife linked up her post on just how to get rid of front loader washer stink. 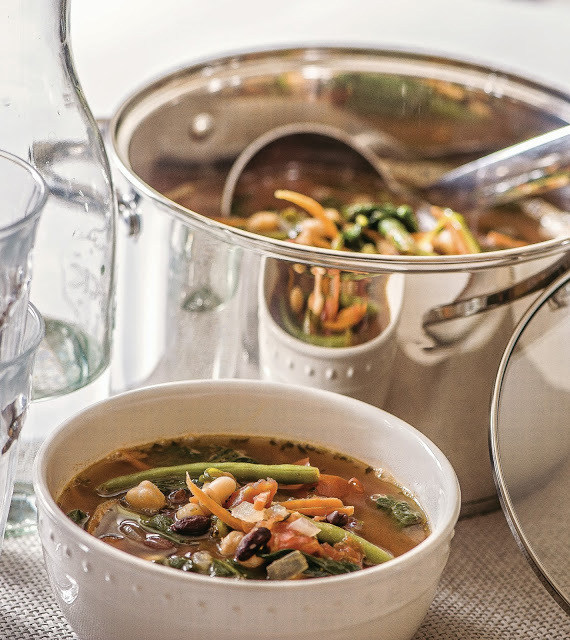 Finally Lois from Walking on Sunshine shared her recipe for Three Bean Minestrone Soup. I am a total soup nut and I also love any type of beans. So since I gave up all meat for Lent this will be a delicious and healthy way to get protein into my diet. 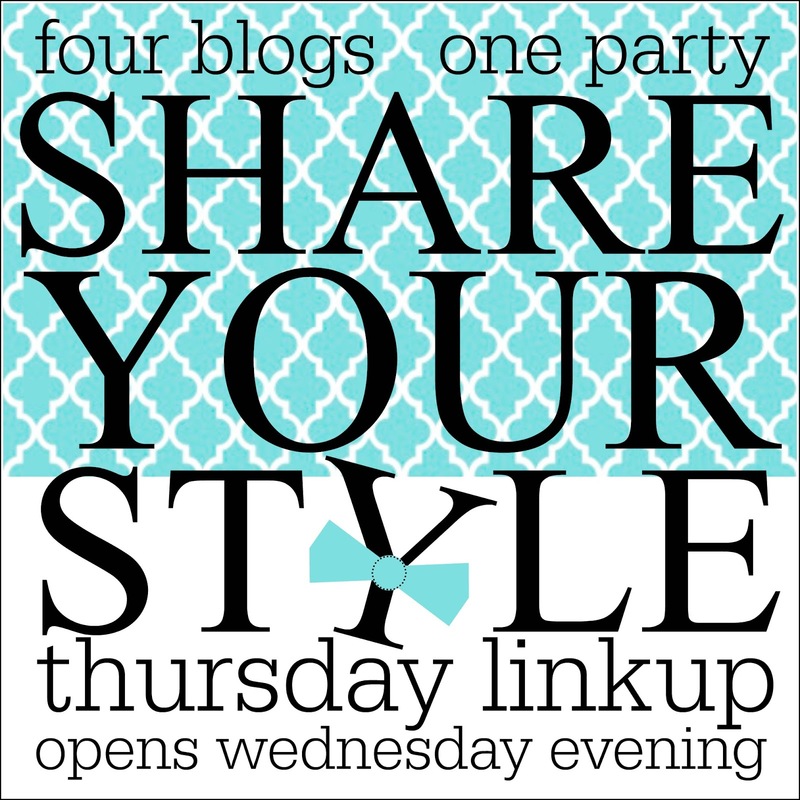 If your link has been featured please make sure to grab our darling SYS feature button before you leave the party! Glad you could join us for another party full of wonderful inspiration! 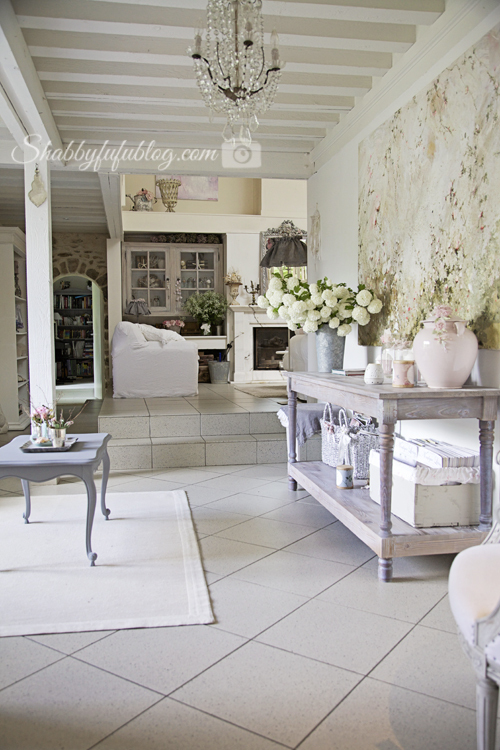 Shabby Fufu shared a Country Home Tour of her friend Tania's home in the countryside of France. 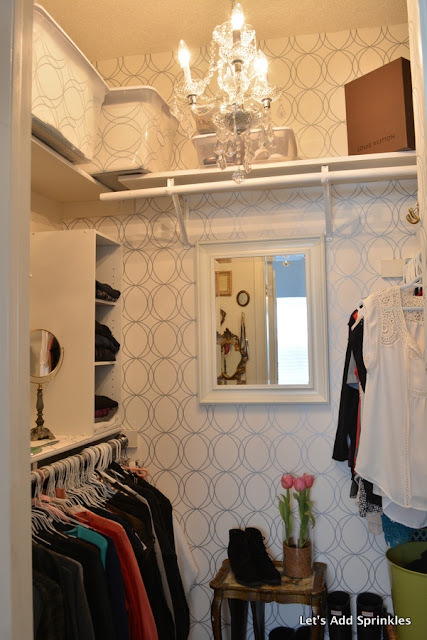 Let's Add Sprinkles revealed her master closet. It is incredible!!!! As in it has a crystal chandelier.....and wallpaper!!!! 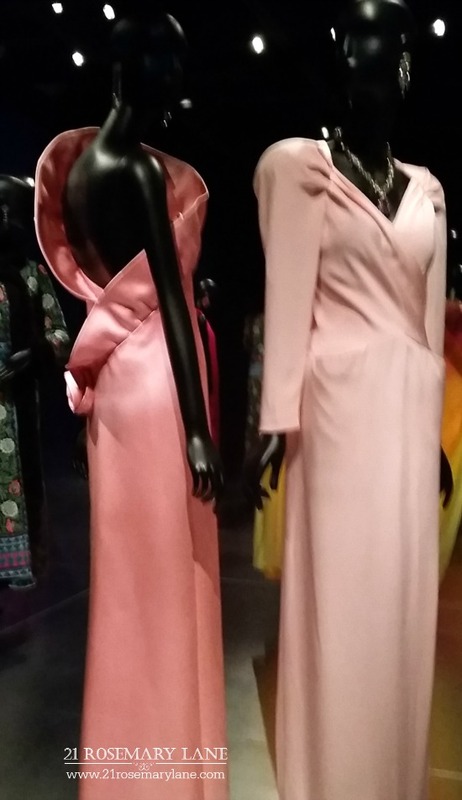 Peony And Orange Blossoms shared pink inspiration for Valentine's Day. 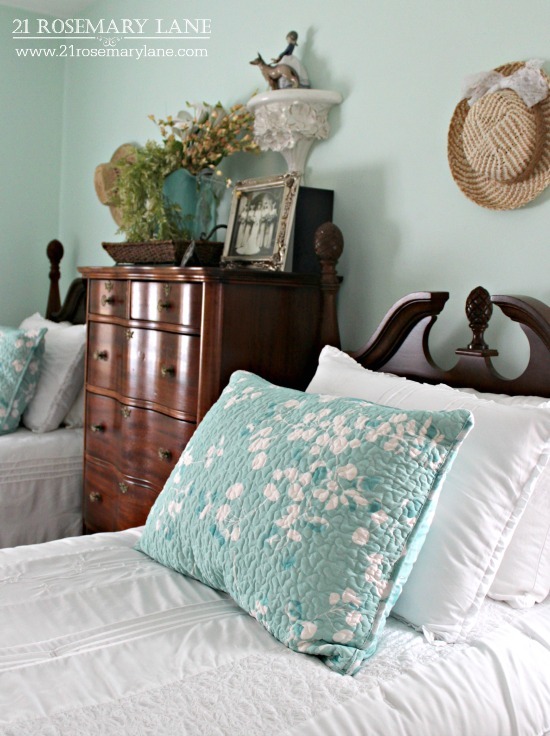 The bedroom is stunning....fit for a QUEEN! 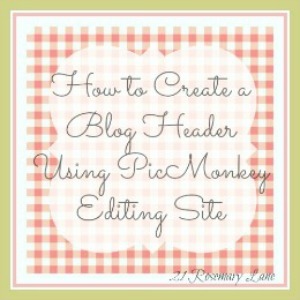 If you were featured please grab this button to display on your blog. Now it's your turn to share what you have been working on this week. 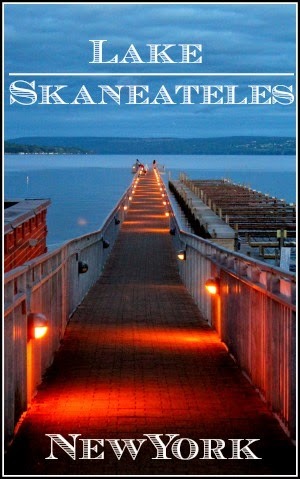 Please remember to include a link back to this party on the post that you are sharing with us. Hi Everyone and Happy Tuesday!!! 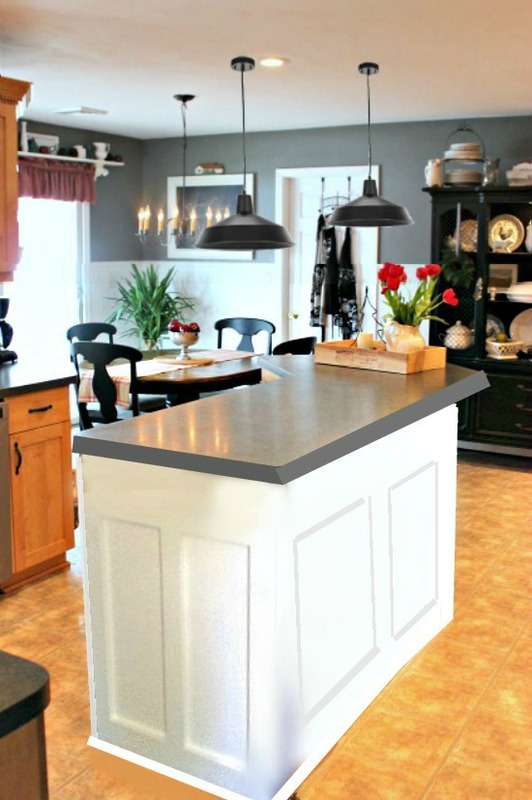 I have to first say thank you to everyone who weighed in on my kitchen island light post last week. (To see last week's post click here.) I truly appreciate your taking the time to let me know your thoughts and I did take them all under advisement. 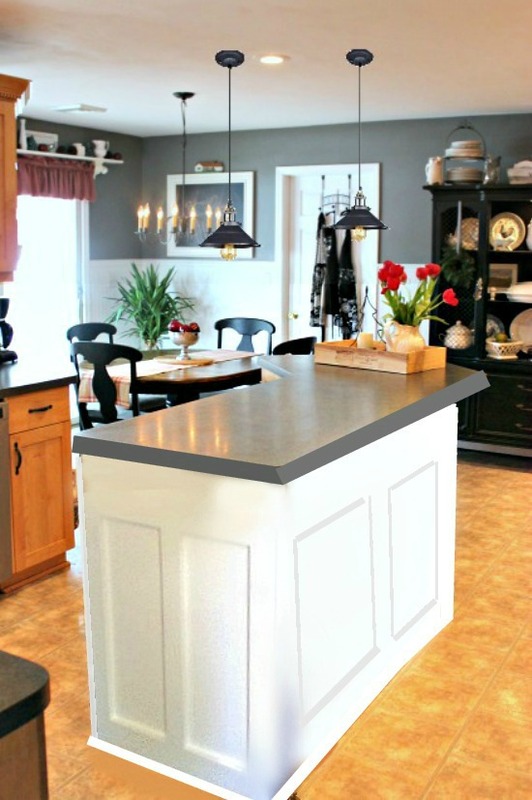 Several of you felt the lantern style lights were too overwhelming hanging above the island, so I went back to the old drawing board and researched a few smaller options. I came up with three new style choices. Take a look and let me know what you think. Remember the lights are NOT to SCALE. They could be a little smaller or larger than how they appear in the mock up. This is just a very rough idea of what they will look like. I really look forward to reading your comments. Believe me when I tell you they are soooooo very helpful. Thanks again for your time and have a wonderful day!!! 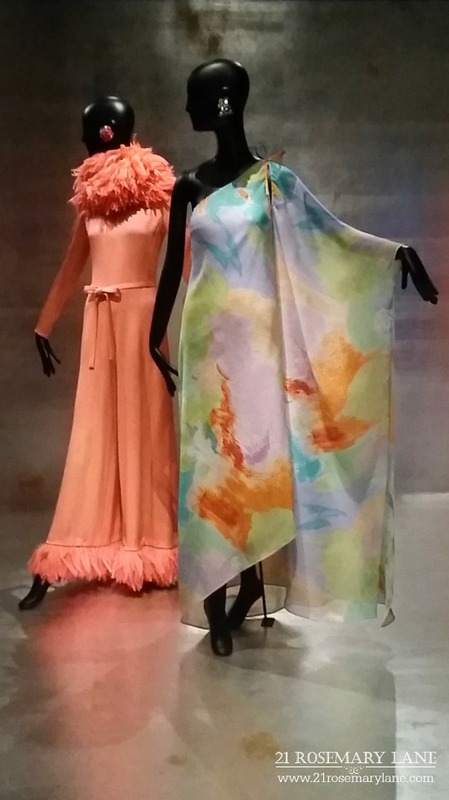 We took advantage of the long weekend by taking kids into New York City for a day at the Metropolitan Museum of Art. 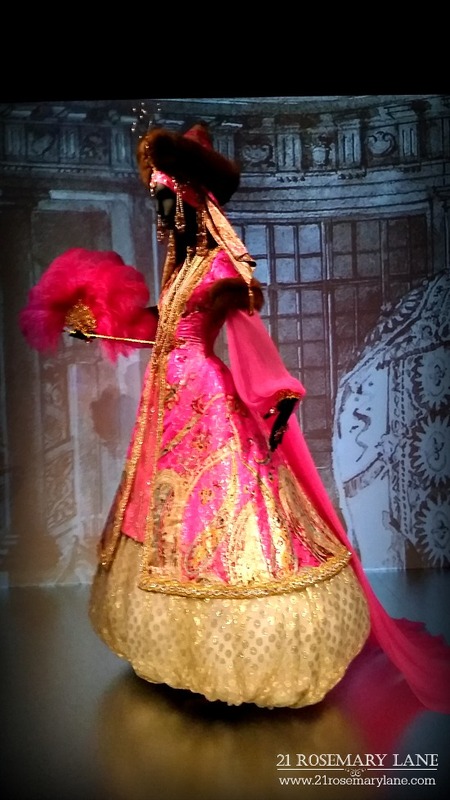 And while we all enjoyed many of the museum's incredible exhibits, one of my favorites had to be Museum's Costume Institute's exhibit The Style of Art. 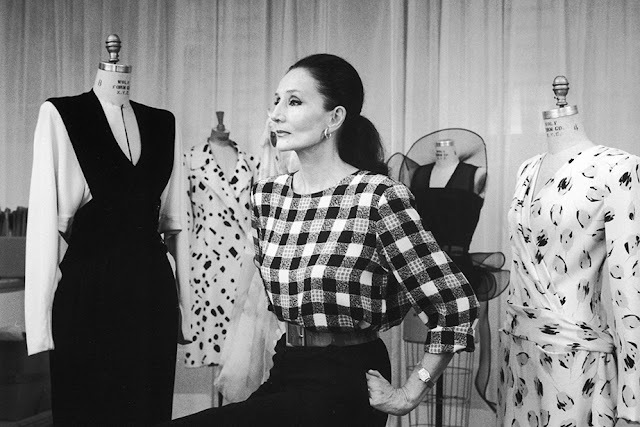 The exhibit, which showcases over five decades of design creations by Balmain, Yves Saint Laurent, Emanuel Ungaro, Guy Laroche, Jean Paul Gaultier and the House of Dior, focuses on the gorgeous and unique designs of French born countess, aristocrat and designer Jacqueline de Ribes. 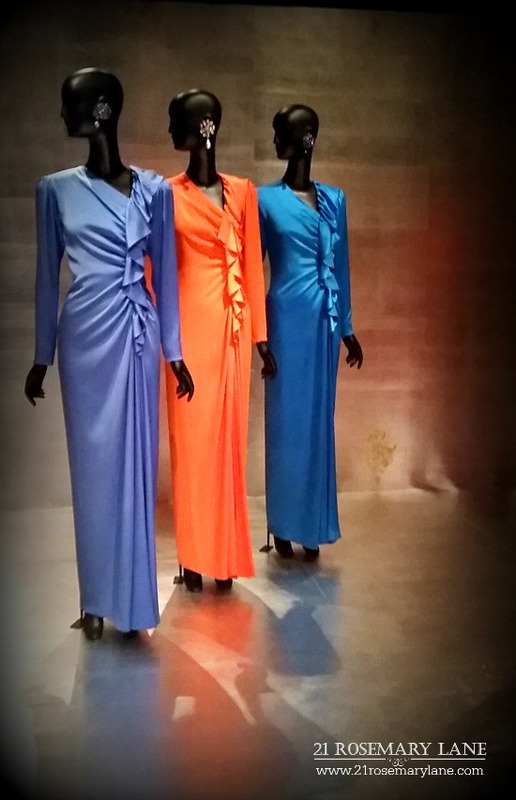 The collection is not only beautifully displayed but includes De Ribe's incredible story 'of how her interest in fashion developed over decades, from childhood "dress-up" to the epitome of international style." Born Jacqueline Bonnin de La Bonniniere de Beaumont on Bastille Day, July 14, 1929, young Jacqueline experienced a childhood greatly affected by hardship brought about by World War II. 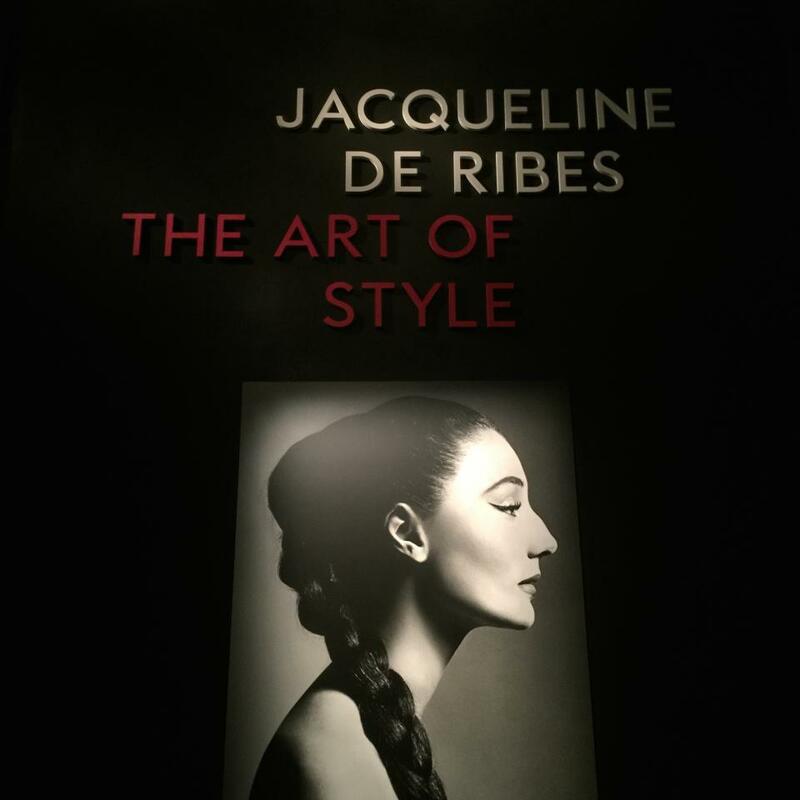 As the result of a series of events, De Ribes lived most of her childhood with her maternal grandfather. She reportedly had a complicated relationship with her mother in the way of acceptance, as her mother was an intellect who translated Hemmingway into French, due to De Ribe's desire to become a ballerina. 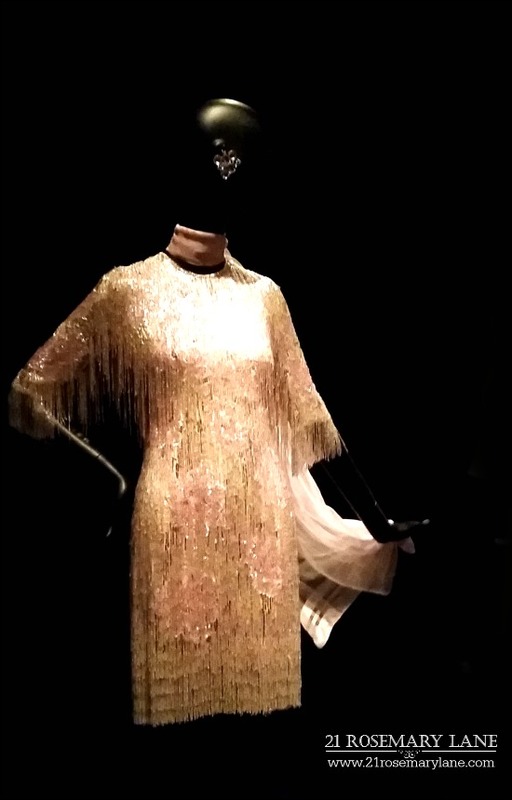 In January of 1949 at age 19, Jacqueline married Vicomte Edouard de Ribes. 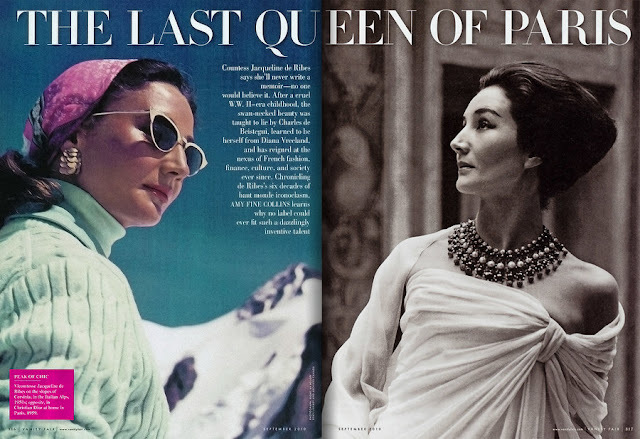 By the age of 25 Jacqueline de Ribes was featured on the International Best Dressed List. This honor was bestowed on her so many subsequent times that in 1982 De Ribes was eventually inducted into the Best Dressed Hall of Fame. De Ribes clientele includes such famous faces as those of Joan Collins, Cher, Danielle Steele, Barbara Walters and Raquel Welch. 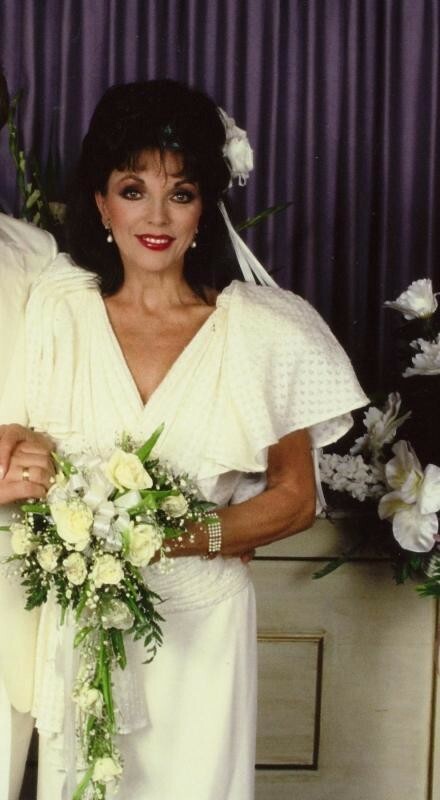 Collins wearing a Jacqueline De Ribes design for her 1985 wedding to Swedish singer Peter Holm. 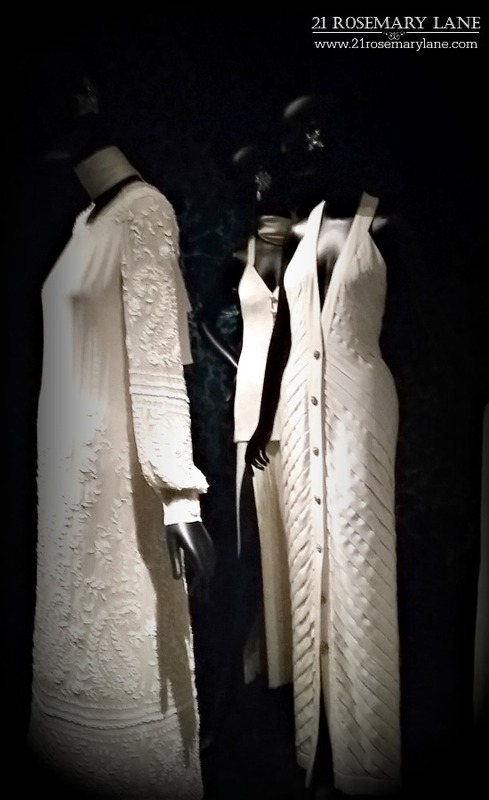 The Art of Style collection at The Metropolitan Museum of Art opened last November and is going to be closing in less than a week on February 21, 2016.